We were pleased that Yu-Gi-Oh! Capsule Monster Coliseum met our minimum requirements for a strategy role-playing game. Why, you may ask? Because it’s fun when a well-known intellectual property adds to our favorite genre. 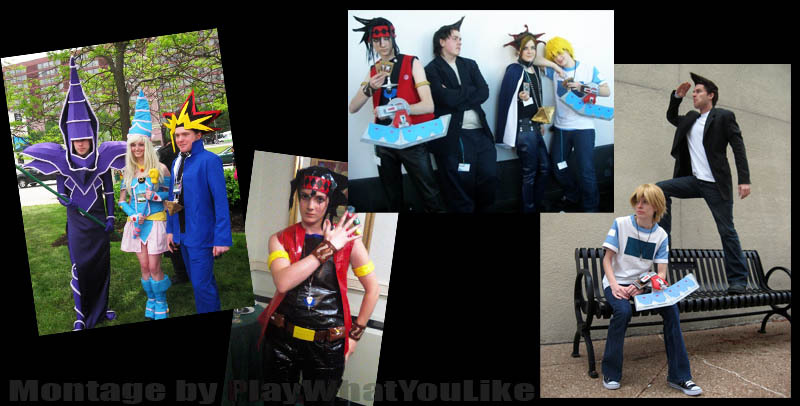 And, truth to be told, this may be our only chance to use gobs of Yu-Gi-Oh cosplay! When we said “gobs,” we meant it. Look, it’s the whole gang! 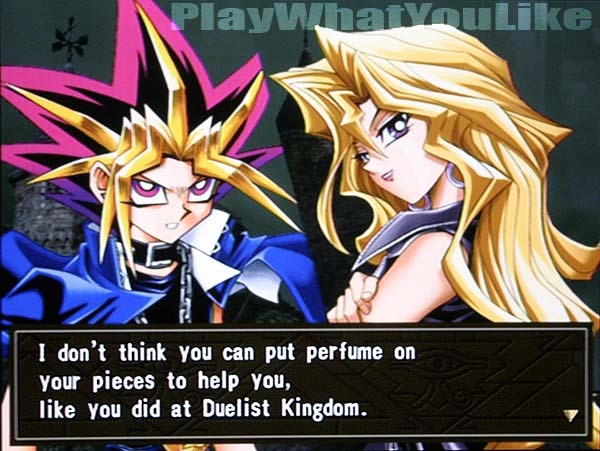 Most Yu-Gi-Oh games offer collectible card battling. We don’t mind a strategy RPG whose combat is card-based. 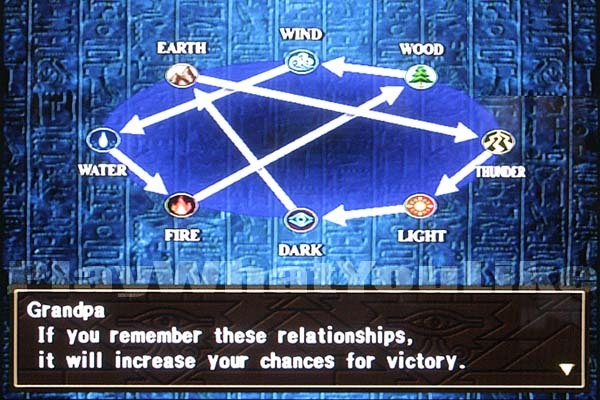 For example we enjoyed Culdcept. However Capsule Monster Coliseum is not a collectible card game playing experience, nor card-based combat. 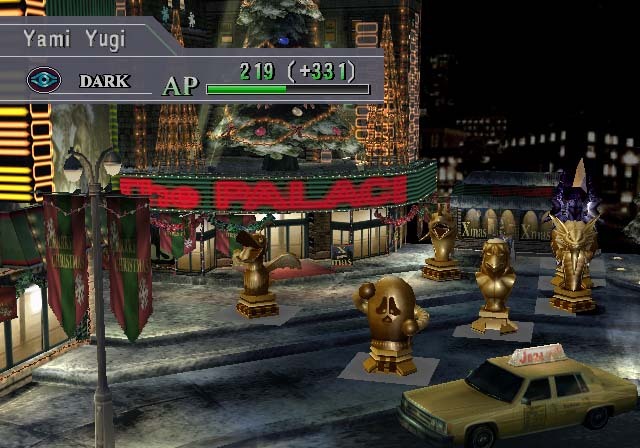 We could describe it as Culdcept meets Pokémon meets chess. The human characters from the show command from the sidelines as creatures based on the intellectual property’s cards enter into combat. The camera looks down upon a 3-D rotatable battlefield environment. Movement and attack are grid based with highlighted squares. * Our asterisk up top next to completion percentage means that we saw 80% of what this game has to show. The game requires multiple victories over the same opponent in order to win some of the most well known card creatures. Decent Music: We know what you might be thinking; “If it’s only ‘decent,’ why include it in the ‘Good’ section?” Well, it’s easy to go wrong with SRPG music. Even quality music can get dinged if there’s not enough and repetition becomes irksome. This music never bothers us, and sometimes we notice it’s quite good and/or dramatic. Spitting Images: The human character artwork is very much in keeping with that of the TV show. The characters look good, and some cases like Ishizu below, very good. Always with the cryptic sayings. Can’t you just ever tell us straight out? Cast Party: Every character from the intellectual property that you can name is in this game. No one’s left out, and that’s saying something. 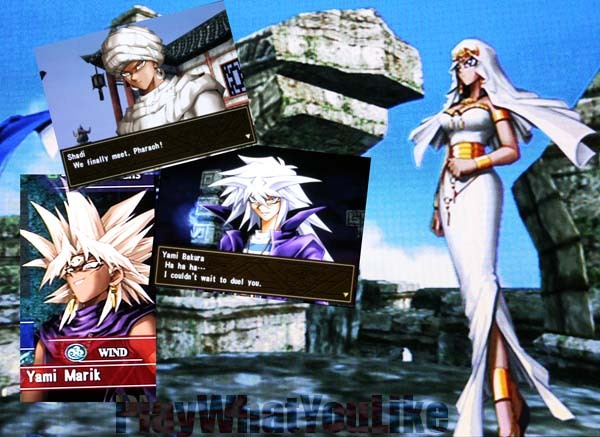 Even characters like Marik and Bakura with dual personalities have both featured. And there’s fun with even the third tier characters like Rex Raptor and Weevil Underwood. Force Structure: You build your battle team using a “MP” point limitation system. It allows for flexibility. With a limit of 100 you can bring in two 50 point monsters or one 100 point monster or any other combination. We’d like to see more of this mechanic in other game’s campaigns and especially head-to-head modes. 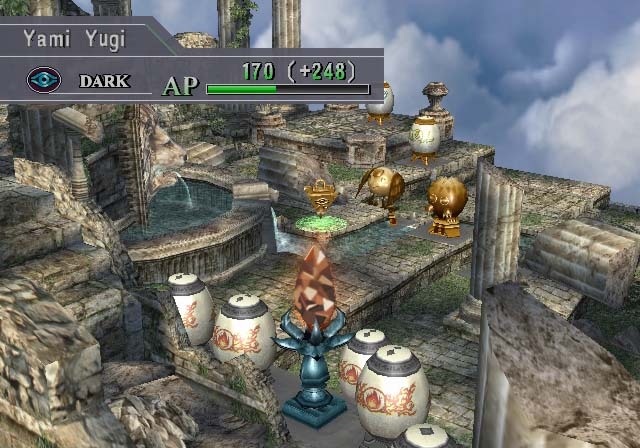 Pretty Places—Except When They’re Ugly: The combat environments are, for the most part, pretty. The textures are good and richness is increased with active environmental touches like animated signs, fish swimming in nearby pools, plus smoke and electrical effects. Some of the environments are ugly, but we think it by design. This environment was not exactly pretty (although it did have animated signs). How it related to Tea Gardner we don’t know. Death Means (at least) Something: A game quickly loses buy-in when loss of a character means nothing more than them leaving one battle. Thankfully Capsule Monster Coliseum adds consequence to character loss. Fallen monsters cannot be used in your next battle. It makes you think twice about who to pick and is welcome incentive. Would that more SRPGs incorporate something like this. Friends to Enemies: While there’s no real story, there’s a progression that helps move things along and makes sense. 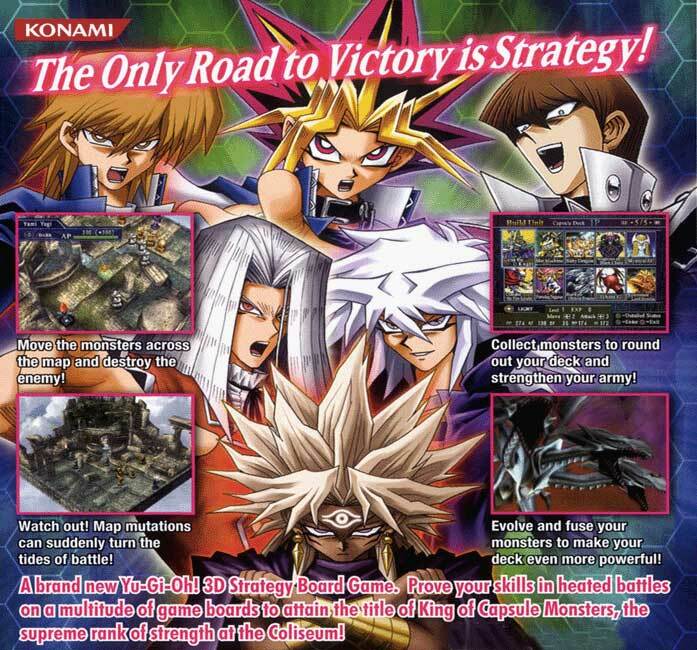 First you play against Yugi’s friends, then rivals, and finally enemies. Starting on a (almost) Strong Note: The opening cut scene is computer-generated and simplistic. It doesn’t show characters nor clarify any story. However after playing the game we understand that approach. It’s different in a good way and of decent quality. We give Capsule Monster Coliseum props for not taking the easy way out, and also for making an anime opening. Nicely done. Is their a minor Yu-Gi-Oh character NOT cosplayed? Not so Special Abilities: In addition to straight-out attacking, a few characters have special abilities. The abilities aren’t worth much, though, and you’re almost always better off just attacking. They need to be brought in sooner and made of more practical value. Down in Front: There shouldn’t be any PlayStation 2 games that fail to fade out environmental objects when they come between your view and the camera. This game does fade them, yet the environment still works against us. At times it obscures the action, and often makes tactical maneuvers more difficult. 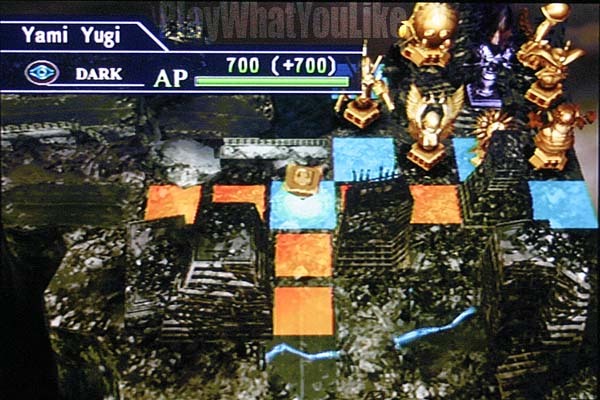 Tactical Maneuvers Misses: It’s difficult in some environments to determine where creature move and attack squares are. Some card creatures operate in nonstandard ways, jumping to a square a number of spaces away. Good for unusual tactics, but more effort to make work than it should be on certain maps. Attributes? What attributes? Creatures have good and bad affinities regarding terrain and opponent types. We appreciate the depth, however the execution is dismal. It all adds up to next to nothing, and in our opinion is a waste of time for both developers and players. 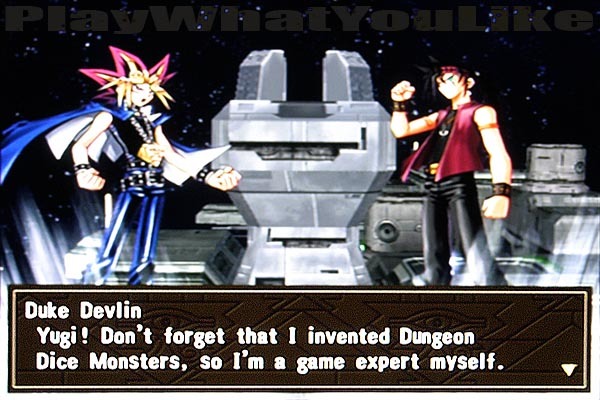 Yu-Gi-Oh… In Space? Many of the environments are pretty, but few make a lot of sense. Most lack a connection between your opponent and their host environment. One time we ended up in outer space. It didn’t make sense. Wha? Where is… What does this have to do with Duke Devlin…? Is he secretly an astronaut? This is a big deal to us. It’s a mechanic we strongly recommend to developers of SRPGs. Incorporating this element can change a standard battle into a memorable confrontation. So it’s pleasing to see this mechanic used to some extent. The dynamic change ideas are not bad either. Rising water, poisoned mist, and electrical discharges are all good. Some make sense, but some not so much. Also, it’s hard to plan for something if it’s a surprise. If the game requires you to make ahead-of-time tactical decisions based on an environmental change, you kind of need to know that it’s going to happen. And while the snow is pretty, what difference does it make exactly? On one rocky, coastal environment they execute a fine idea of raising a wrecked ship into the middle of the battlefield. While that’s a surprise that seems evenhanded, on another occasion panels suddenly and without warning open beneath creatures causing them damage. It makes us raise our hands in quizzical dismay. Battle Animations… When two creatures engage in battle, you’re taken to a separate screen where game engine versions of their likeness blast each other. The animations are just okay, and really not interesting nor quick enough to leave on. We normally have more tolerance for such things, but in this case turned them off before the end of the first battle. Yu-Gi-Oh Monsters are Not Pokémon: Yu-Gi-Oh creatures vary greatly, but here they all hit similarly. Pokémon have kinds of attacks that differentiate them. That’s generally not the case in Capsule Monster Coliseum. Cute little Kuribo hits just like some nasty looking monster. Rock Paper Scissors Fail: Also like Pokémon, certain creatures are supposed to be more vulnerable or effective against other types. That whole thing could have been dropped with zero effect on our playing experience. 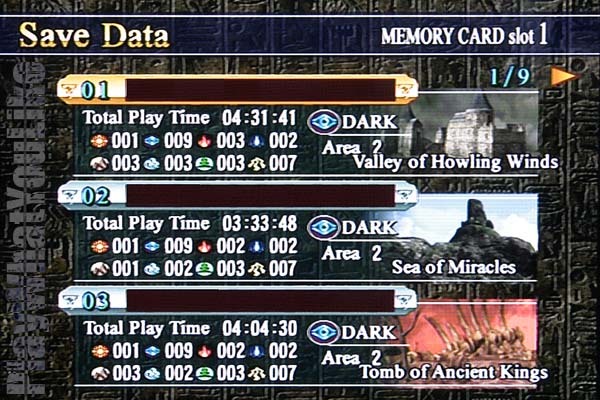 Slogging: The PlayStation 2 has enough horsepower for commands to not be slow and sluggish. Believe us, one million half-seconds adds up fast. It quickly drains goodwill you have for a game. You get to duel Pegasus twice. The owner of the Millennium Eye, inventor of Duel Monsters, and bad guy turned good(ish) guy. Oh stop grovelling Kaiba! 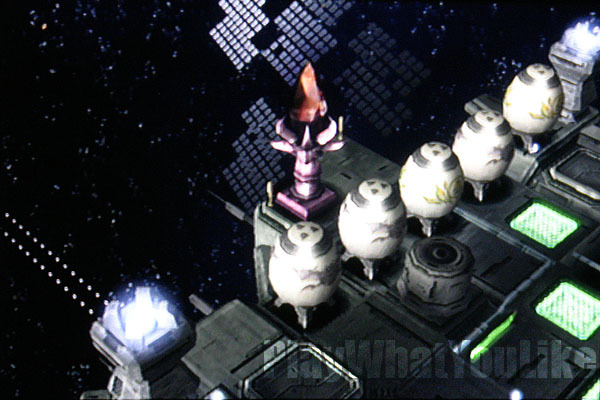 Capsule Launching: There’s just no fun reason to place creatures in an egg-like capsule at the start of every battle. It takes a number of turns using up your limited action points just to hatch them. A waste of time and patience. Too many EGGaserbating turn wasters… and that’s no EGGaggeration—yes, a pun too far. Three-dimensional Chess… Minus 2 Dimensions: With special attacks making no difference to the gameplay even halfway through the campaign, you are just left with hitting hard, hitting fast, and hitting first. The attrition strategy is shallow and mostly requires you to keep your units together and gang up on the enemy one by one. Ho hum. 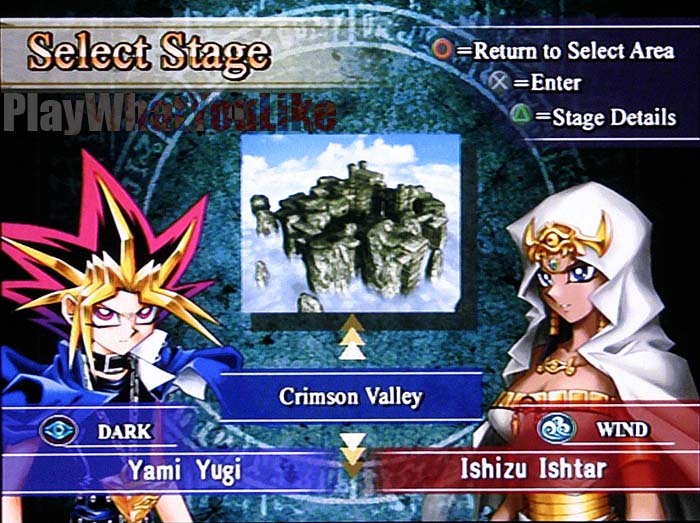 No Star Power: We know original series Yu-Gi-Oh creatures pretty well. Aside from Karibo, we encountered none of the big-names. No Dark Magician. No Blue-Eyes White Dragon. It’s like starting a football game without your star quarterback. Having to play through multiple times in order to get them rots. Button Economy Fail: The game is already sluggish, so adding unnecessary button presses for common actions only magnifies the problem. Why are you asking me if I want to level up a creature? Is there any reason not to? When creatures level up during battle, restore their hit points and abilities. That may give them some much needed life. 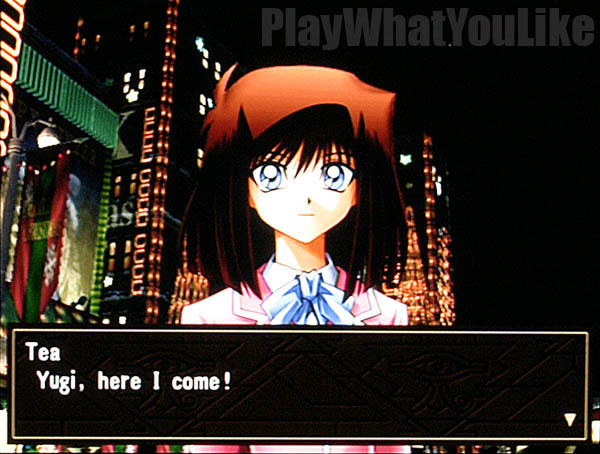 Mai Valentine. The bad girl with a heart of gold. 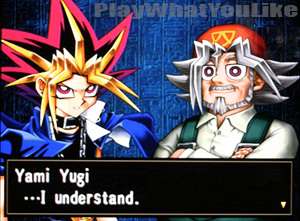 Never has the fun and excitement of Yu-Gi-Oh been made so dull. Yawn. Thankfully, the essence of the series is not in the monsters but in the characters. If not for them, and the really good voice work, there would be been little reason to stick with this story-less experience. Honestly, if you’re going to go through all the trouble to get the entire—ENTIRE voice cast, you might want to spend a little time giving this game a story. 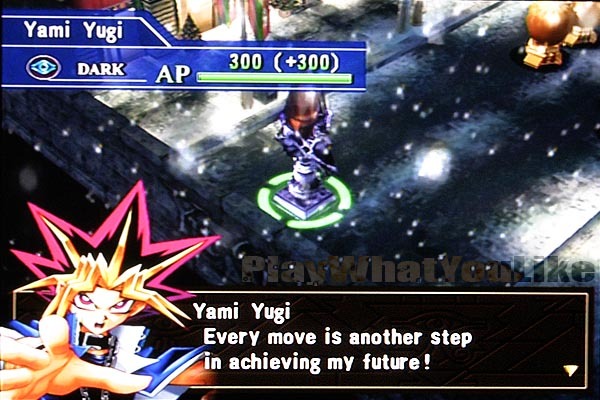 There are about 600 Yu-Gi-Oh games. Most fall into the puzzle category with a few being strategy. Their quality varies, and some, if you believe the reviews, are quite awful. 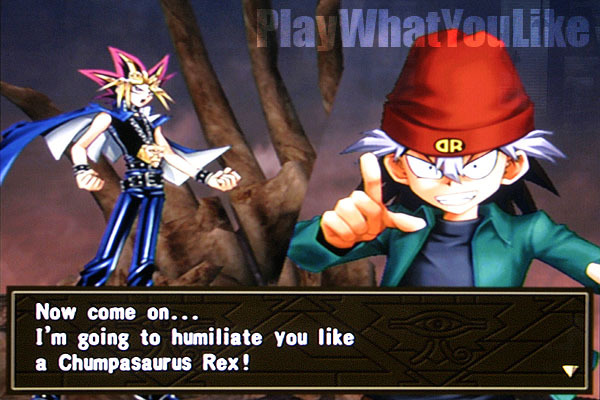 We can attest to having played “Yu-Gi-Oh: Duelists of the Roses.” It was indeed a… subpar experience. 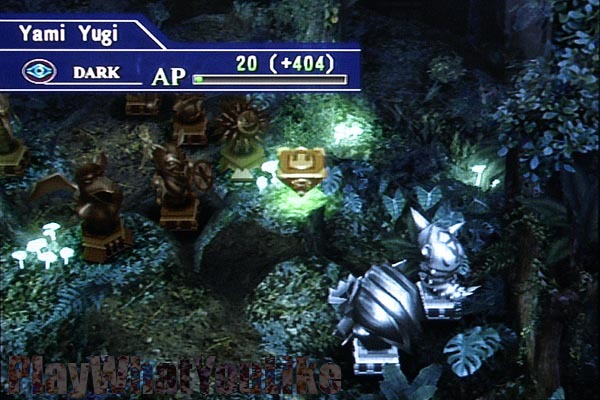 Capsule Monster Coliseum barely met our SRPG criteria, so we didn’t judge it like genre greats Final Fantasy Tactics or Tactics Ogre. However it’s not as if the developers were incapable of hitting the mark. We saw a lot of potential here… just not realized. If you’re a big fan of collectible card games, this game is probably not for you. If you are a big fan of the SRPG genre and are looking for a solid gameplay experience in that category, this game is also probably not for you. Nor do we think it will be very satisfying to Pokémon gameplay fans. So who is this game for? 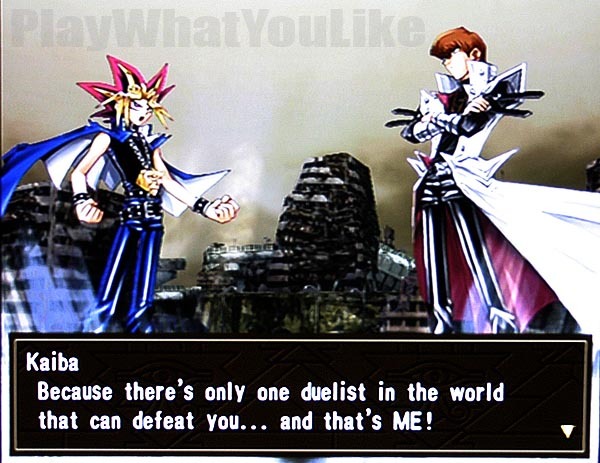 Perhaps those who really like the characters and are fans of Yu-Gi-Oh. We certainly enjoyed seeing and hearing all the minor characters. It’s really the only thing that kept us playing. Updated 07/28/2016: Gobs of new, better, larger pictures. Refined and polished text. Extreme cosplay! YuGiOh episodes 60-62 featured another wielder of Yugi’s favorite Dark Magician card. Arkana had the red “bad” version—and a goofy mask. It was a great battle featuring most of the characters pictured above. Well done “Arkana” and fellow dedicated cosplayers.